Well I've had the chance of testing Handbrake more in details and I've found out that there is a lot more to this update than the main features highlighted. Something new with this update that is not included in the download of the new version is the presets. To update the presets, you just have to click on the gear icon just under the presets and choose "Update Built-in Presets". 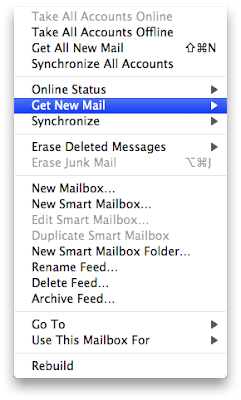 If you are using Mail to follow RSS feeds, you can force Mail to update the feeds in the Mailbox menu, under "Get New Mail". You just have to choose "RSS". Mail will then download the latest posts from the RSS feeds. 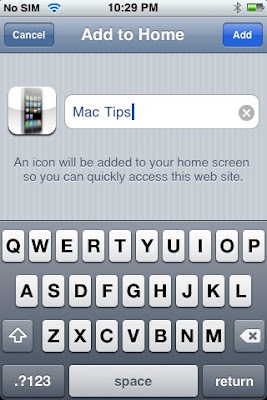 A great tip submitted by David Kinnander: Airport hidden menu! Wow, I didn't know this. It is awesome. By holding down "Option" and clicking on the Airport menu, you'll get a lot of additional info. You'll get info about signal strength, MAC address, etc. The MAC address displayed is the MAC address of the base station, not of your Mac. Thanks for the great tip David! I've wanted this for a while, I just didn't have time, but here it is: the new "A New Mac Tip Every Day". You can check out the new website at http://tips4mac.info/ It is a totally new design, based on Wordpress instead of Blogger. Most comments have been imported from Blogger. Some comments, especially in the past week haven't been imported though. They can still be viewed on the Blogger website. If Handbrake was in my top 10 applications to install right away when I get a new Mac, it now holds the #1 spot. The version 0.9.3 was released and it is packed with improvements. I first want to talk about the downgrade, it is not possible to use it with encrypted DVDs anymore unless you have VLC installed. So it is not much of a downgrade, you just have to make sure to have an up-to-date version of VLC and you won't have any problems. I think the best new feature is that the source is not limited to a DVD or a VIDEO_TS folder. You can convert most video files with Handbrake now. It is using the FFmpegX project for the conversion. I think that's a great news because Handbrake has always been many times more efficient at using multiple cores than QuickTime. There is a lot more to talk about and you'll probably hear more about it soon. You can get the new version of Handbrake here from MacUpdate. If you want to eject a DVD or a CD, you have to hold down the Eject key for a few seconds, otherwise, it won't eject. You can bypass the time delay however. You just have to press "Option - Eject" and it will eject instantly, without having to wait a few seconds. A great tip submitted by Stephen: Drag and drop bluetooth transfer! If you are using Bluetooth File Exchange to transfer files between bluetooth devices (including Mac to Mac), you can add the icon to the Dock and just drop the files you want to transfer on the icon. If you don't have a local network setup, it is a quick way of transferring files between Macs. Bluetooth File Exchange.app is located in the Utilities folder. Thanks for the tip Stephen. If your Time Machine drive is not hooked up for a while (on a trip without your external hard drive), a warning will keep coming saying that Time Machine failed backing up. You can disable it in the Time Machine preferences to avoid the warning when you are often away from your external drive. You just have to uncheck "Warn when old backups are deleted" under "Options...". 1. Add "Get Contents of Clipboard". 2. Add "Text to Audio File". 3. Add "Import Audio Files". 4. Add "Add Songs to Playlist". You can get more details about the workflow here from Automator.us (you can also download the workflow from Automator.us). 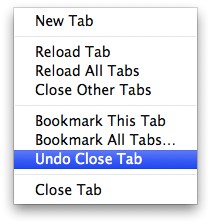 If you close a tab accidentally in Firefox, you can easily reopen it by right-clicking in the tab bar and choosing "Undo Close Tab". Of course, that will actually reload the page, so you might lose information that you entered in text boxes. Now playing iTunes status in Adium! 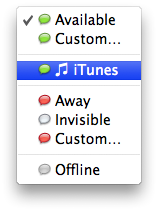 One of the options for the status in Adium is "iTunes" and what it does is it takes the metadata of the currently playing song in iTunes and set it as your status. You can also set a different status for each account in Adium under the "Status" menu. I talked about how to zoom in and out in QuickLook when Leopard was released, but that was only through a keyboard shortcut. What I discovered is that you can do the same thing by holding down "Option" and zooming in and out using the scroll wheel. 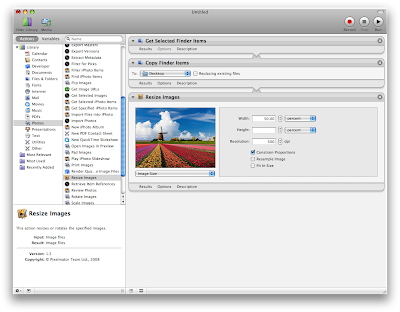 It works both in the QuickLook window and in full screen QuickLook. Exact URLs in the Firefox address bar! I am so used to having to type exact URLs in the address bar that I hadn't noticed until now that in Firefox 3, you can enter keywords of previously visited website in the address bar and relevant URLs from the Firefox history are displayed. I used to search with Google when I didn't have the exact address, but it is now a much quicker way to find a URL that I know I have already visited. You just have to enter the keywords separated by a space. Uninstalling an application on a Mac is usually as easy as dragging the file from the Applications folder to the trash. It doesn't work with Final Cut Studio, because so many files are installed everywhere. I've had a few issues with Pro Apps where updates broke the app and I had to reinstall from the DVDs. I had to look through forums to find out exactly what files to delete before reinstalling, because if you don't delete everything, the app won't start after the reinstall. A freeware called FCS Remover 2.0.2 takes care of erasing the files for a complete uninstall. You can also select single applications to uninstall. FCS Remover is a free download from MacUpdate. Convert a PDF to plain text! 1. Add the "Get Selected Finder Items" action. 2. Add the "Extract PDF Text" action. 3. Select a PDF file and run the script. The plain text will be saved on the desktop. The Moon Phase Calendar in iCal! Someone asked me if I had a calendar with the moon phase this week. What is great about iCal is that it is totally customizable. You can download calendars or subscribe to calendar feeds. I didn't find a feed for the Moon Phase, but I found a downloadable calendar on Apple.com that is good until 2015. To subscribe to a calendar in iCal, go to "Calendar" and choose "Subscribe...". You can enter the feed URL from there. For a downloadable calendar, you just have to double-click on the file you downloaded and iCal will let you add it to an existing calendar or create a new one. Here is the download link for "Moon Phase Calendar 2.0" from Apple.com. If you decide to save your script for future use, you can use "Save as plug-in" in the File menu and save it to the Script Menu or to the Finder. I was impressed when Steve Jobs first showed the multitouch trackpads, but I really don't use it that often now that I have a MacBook Pro that can do it. A few things are wrong with how it works. It just doesn't work in enough applications to really make it useful. One thing that totally makes me hate the way it works is when it resizes icons on the desktop. I talked about a beta of Firefox that included multitouch and it helped, but I still didn't switch to it. Someone figured out what is missing and released it as a preference pane add-on. It is called MultiCluth. It lets you set what each gesture does in each application. You just have to tell the application the keyboard shortcut equivalent of what you want it to do. You can even set system-wide gestures. You can download MultiCluth free here from MacUpdate (it is in beta). Group by page when searching through a PDF! I talked about the amazing service of Dropbox a few weeks ago and I have now discovered another great feature. The Dropbox automatically comes with a Public folder and you can use it to share files easily. When you drop a file in the public folder of the Dropbox, it automatically gets a public URL where it can be accessed. You can get that URL by right-clicking on the file, and choosing "Copy public link", under Dropbox. You can then send that link to people you want to share that file with and they will be able to download it easily. Snapping in Final Cut Pro! A very important feature when you are editing in Final Cut Pro is snapping. I constantly turn it on and off depending on if I want to align clips without having to zoom in frame by frame or if I just want to move a clip accurately. You can easily try with both snapping on and off by hitting "n" and then moving a clip in the timeline. Something that I have just discovered today is that you can actually temporarily enable or disable snapping for only the current operation. What happens is that if you are moving a clip and find out that you don't want snapping (or the other way around), instead of releasing the mouse, hitting "n", moving the clip, and hitting "n" again to reenable snapping, you can just hit "n" while holding the clip. It will temporarily disable snapping, but as soon as you release the clip, snapping will be turned back on automatically. 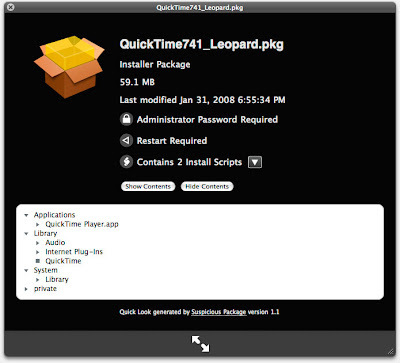 There really is a QuickLook plugin for everything now, even for Apple installer packages. I didn't think the idea was that great at first, but it is really well implemented. It shows relevant information such as if an administrator password is required and if a restart is required. It also shows information about the install scripts. You can get the plugin called Suspicious Package here from MacUpdate. A great tip submitted by Kenneth Fung: I really like Firefox 3, but sometimes there are just a few features from Safari that I wish were also part of Firefox. The Firefox extensions pretty much solves whatever is missing in Firefox and there is also one for viewing PDFs just like in Safari. It is very simple and it works great. Thanks for the tip Kenneth! You can download the Firefox extension here. Watch Hulu outside the US! Hulu was launched just after NBC left iTunes and it is actually pretty great. There is a lot of free content and the ads are very short. It unfortunately only works in the US and I've looked for a solution in the past, but I hadn't found anything. The solution came this week from the podcast Command-N. It is called AnchorFree and what it does is using a VPN, it shields your IP address. It is compatible with both PC and Mac and it is much better than Web proxies, because it actually has a menubar icon and menu to control it from there. Of course, you don't want to leave it connected all the time, because it adds advertising and all your web traffic goes through this. You can learn more and the download the app here from AnchorFree.com. Thanks for the tip Command-N.
A more powerful Time Machine! One thing that I was disappointed about Time Machine is how little you can customize the preferences. There is a freeware called "TimeMachineEditor" that lets you change the default one hour backup interval. You can download TimeMachineEditor here from MacUpdate. 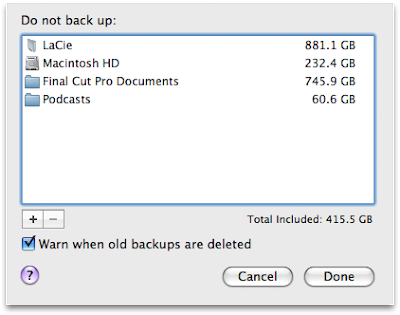 I think this solves a part of the problem, but there is still a feature that I would like to see and I really hope Apple will consider it for Snow Leopard: the possibility of limiting the amount of space Time Machine is allowed to use on the external drive. That's probably obvious for many Photoshop experts, but even though I use Photoshop daily, I didn't know that was in there. It is probably because I don't take the time to learn Photoshop, I use it for what I need to do and I look for the features when I need them. I was doing some rotoscoping today and I absolutely needed to put points outside of the canvas. In the past, I just unzoomed to add those points, but I really had to be zoomed in this time and it is just not possible in the default way Photoshop works. What I have discovered is that it is easy to do this in full screen mode. To toggle between the modes, including full screen, you just have to press "F". One thing that I really wish Apple had implemented in Aperture is the possibility of applying adjustment settings in batch (to multiple photos at once). It is possible to do something similar by copying adjustments and pasting them on multiple photos. 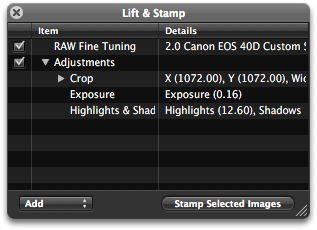 To do so, you just have to right-click on the photo that has the right adjustments and choose "Lift Adjustments". A semi-transparent window will appear with a list of all the adjustments that you copied. You can then select multiple photos that you want to apply the adjustments to and click on "Stamp Selected Images" in the semi-transparent window. The adjustments will then be applied to all the photos selected. It is also possible to remove some of the adjustments in the list before stamping them on other photos by simply selecting the adjustment and click on "Delete". MobileMe not working in Mail! If MobileMe mail doesn't work the way it should in Mail, you can change the port used for the connection and it usually solves everything. This is actually AppleCare's recommendation. 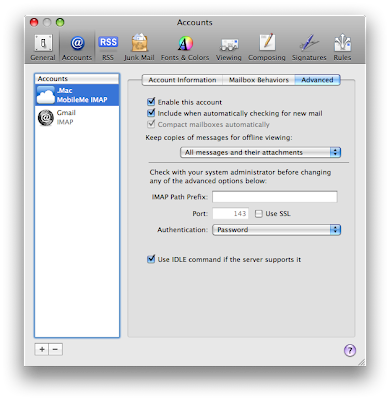 Checking the box next to "Use SSL" in the account preferences will change it from the default 143 to 993. I have had this problem happen a few times with new Macs and using this has always solved the problem. 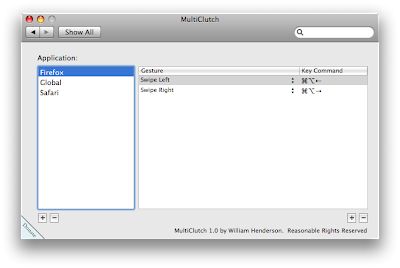 The shortcut "Command - M" already minimizes a window in most Mac applications. Adding "Option" to the shortcut will actually minimize all windows currently open in a specific application. It doesn't work with every app, mainly with apps from Apple (it doesn't work with Firefox, but it does with Safari).